Business drives the world as everyone needs money to make a mark in the world. The term business itself refers to a “regular occupation, profession, or trade”. This can refer to individuals, communities or organisations. No matter what happens around the world, people do need to work in the profession of their choice. This is now becoming easier with more options presenting themselves to everyone. Everyone knows what is happening all around the globe and can pick and choose what they would like to do. The competition also is more, of course, and this means we must truly be so good that everyone comes to us for our merit. In the area of selling our goods, again options are many nowadays. Here, digital marketing does have a big role to play. With people striving to do their best, they connect with each other by accessing each other digitally for the future is indeed digital. This is what shall make the world move forward. Visionaries do recognize this clearly and wish to bring this in their future plans. There are many companies seeking to use this to the maximum extent possible. For the a proper strategy does need to be defined and many people are doing this. 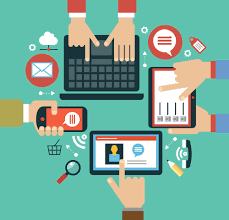 It is easy if one understands the tools that are required for digital marketing. These tools are not complicated. One only needs an open mindset to acquire the necessary skills and then march forward. Money is of course, always a criterion. In marketing, money and the budget is always a serious concern. Fortunately, in digital marketing, the costs are also minimal as the technical world takes it forward with almost zero budget for marketing personnel. The online world makes people check everything digitally so here again, it is important we need to indeed be perfect in all areas. It is very important to see what is being said about us all over the world. One’s reputation can also be streamlined digitally and indeed many people are indeed doing this. Reputation building is also a big exercise where often, a lot of money is involved. Here, again, digital marketing can play a big role when one selects what needs to be conveyed, how to do it and choose all the tools that enable us to do this. With many social media platforms, this is indeed becoming mandatory for almost everyone and any investment made here is truly worth it. Though we in India were thought to be underdogs, in the digital world, we are equal to everyone and shall indeed be able to make a key difference to all businesses by acquiring the necessary skills and showcasing the business as it needs to be showcased, keeping in mind all the needs and using the right technology that is available all around us in the new world. We only need to be present and completely aware here. For we surely don’t want to be left behind in the new digital world.